A resilient Marine Transportation System is imperative to our nation’s economic prosperity and national security. For more than 228 years, the Coast Guard has facilitated maritime security to promote and safeguard American commerce. Maritime commerce accounts for $4.6 trillion in annual economic activity and 90 percent of U.S. imports and exports occur by ship. By 2025, we expect the demands for waterborne commerce, energy, food, resources, and recreation to double. Today in the Coast Guard’s 8th District we announced the Maritime Commerce Strategic Outlook, which outlines the Commandant’s long term vision to support and grow maritime commerce in the United States. We chose the 8th District because it is at the center of our operations in the Western Rivers, which are critical maritime arteries that fuel commerce and connect our nation’s Heartland to consumers around the globe. In my role as assistant commandant for prevention policy, my staff and I are actively engaged in the implementation of three major lines of effort: facilitating lawful trade and travel on secure waterways; modernizing aid to navigation and mariner information systems, and transforming the workforce capacity and partnerships. Any disruptions to the Marine Transportation System, whether man-made or natural, will have a cascading and potentially devastating effect on the domestic and global supply chain and America’s economy and national security. As the lead federal agency protecting our MTS and the primary regulator of the maritime shipping industry, the Coast Guard advances American prosperity by securing ports and waterways and ensuring vessel safety. We will achieve this by managing risks to critical infrastructure; through efficient delivery of Coast Guard services; supporting uniform and consistent vessel and facility standards; and promoting resiliency and unity of effort among all MTS stakeholders. America must be competitive as a global trading partner, and the Coast Guard will drive modernization of IT networks and applications that enable us to assess, monitor, and manage risk. The service will optimize traditional navigation systems as we build the next generation waterway management and aids to navigation systems. Further, we’ll seek to adapt regulatory frameworks, applications, and standards to accurately incorporate the implementation of emerging technologies that will transform maritime operations such as autonomous systems and new logistics platforms. The maritime operating environment is increasingly complex and the Coast Guard must transform its workforce and strengthen its partnerships with other enabling organizations to meet the increased demand on America’s waterways. We will leverage the capabilities of Third Party Organizations that conduct work on our behalf, while providing a robust oversight regime that monitors their performance and ensures compliance with required standards. • Staff in the 8th District have been working with the American Waterways Operators to review the floating aids to navigation system along the Western Rivers to identify hazards. • Through the Truman-Hobbs Bridge Alteration Program, we’ve partnered with private sector to investigate bridges identified as unreasonably obstructive to navigation. • We continually participate in global efforts to safeguard maritime activities through involvement with bodies such as the International Maritime Organization, the International Marine Aids to Navigation Association of Lighthouse Authorities, and the International Hydrographic Organization. • We’ve begun the process to designate Shipping Safety Fairways off the entire Atlantic Coast, as informed through the recent Atlantic Coast Port Access Route Study. • Through partnership with DHS, we’ve develop better analytical tools, data, and technologies to improve MTS resilience following an emergency. • We’re improving our third party oversight program, including creation of a new Headquarters office solely focused on driving improvements necessary for robust oversight of third parties and delegated functions. • We’ve developed more rigorous procedures and detailed policy for both third parties and Coast Guard marine inspectors, a substantial increase in auditor training to improve the proficiency of Coast Guard personnel, and established metrics and key performance indicators to monitor third party performance. • We’ve made significant progress toward a single U.S. Supplement to the classification society rules and SOLAS. The Coast Guard will use its unique law enforcement, intelligence, and regulatory authorities to grow and safeguard maritime commerce in the U.S., but the challenges facing our waterways require continued collaboration with private sector and government agency stakeholders at every level – local, state, national, and international. We look forward to working with our partners and stakeholders as we execute the lines of effort in the Maritime Commerce Strategic Outlook. This week TVIB’s staff participated in the first annual USCG Oversight Workshop at Sector Houston-Galveston. 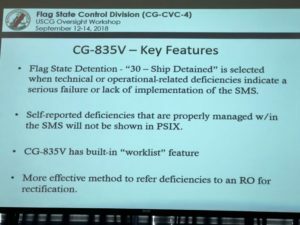 The newly formed Flag State Control Division CG-CVC-4, headed up by CDR Michael Simbulan, put together a 3-day workshop. In his opening remarks, RADM John P. Nadeau, Assistant Commandant for Prevention Policy, told the USCG personnel in attendance that they are charged with being “ready, relevant and responsive.” He finished his comments by telling all in attendance “We’re in this together. TPO failure is Coast Guard failure. Their success is our success.” TVIB staff took this as a very encouraging sign and believe it’s to our mutual benefit to establish solid working relationships. The first day was attended by TPOs, classification societies and USCG marine inspectors from around the country. The next two days were scheduled for the marine inspectors only, to conduct training on the oversight activities of CG-CVC-4. This division was stood up as a result of the investigation from the El Faro and the need for increased oversight for third parties that conduct activities on behalf of the Coast Guard. The oversight responsibilities of this new division are much broader than Subchapter M.
TVIB was asked to discuss Subchapter M from a TPO Perspective. Chris Parsonage, Executive Director for TVIB, addressed the role of a TPO, TPO responsibilities, the survey and audit reports and their function as objective evidence, and the relationship between the TPO and the USCG. Chris finished with the benefits of the TSMS option such as improving safety and operational effectiveness as well as the recently highlighted opportunity for TSMS option vessels to request their TPO to clear deficiencies noted on a CG-835V. We’ll be working directly with our TPO customers in the coming days to ensure they know how to take benefit of this option. Calling on your TPO to clear a deficiency is likely to expedite the process of clearing out deficiencies if an operator does not have to wait on a marine inspector. Our auditors and surveyors are generally available and willing to go out when called. TVIB staff also had the opportunity for a one-on-one conversation with RADM Nadeau where we were able to communicate issues that we face as a TPO as well as those faced by our TPO customers. This presented an opportunity to advocate for a simplified COI application process that would be used consistently from district to district and OCMI to OCMI. We are preparing a marked-up vessel particulars document in hopes of streamlining the data collection activity for the marine inspector by eliminating questions that are not relevant to inland towing vessel operations or helping to clarify terminology. TVIB appreciates the opportunity to participate in this forum. We had access to leadership from the TVNCOE with CDR Andrew Bender and CG-CVC with Capt. Matt Edwards. Any time we can get together to share concerns and develop strategies we increase understanding all around. This forum presented us with an opportunity to put faces to names for many of the sector and unit personnel we regularly work with. We thank all of our industry partners and the marine inspectors that came in for this session.